Dogs Bite Decatur Al: ROGERSVILLE, CHRISTIAN COUNTY MO - JOSEPH AND LINDSAY BRINK WERE INDICTED AND BOOKED ON INVOLUNTARY MANSLAUGHTER CHARGES FOR THE 2015 MAULING DEATH OF WERNER VOGT, 85 - "THEY WERE AWARE OF THE AGGRESSIVE DISPOSITION OF THEIR DOGS AND FAILED TO MAINTAIN ADEQUATE CONTROL"
ROGERSVILLE, CHRISTIAN COUNTY MO - JOSEPH AND LINDSAY BRINK WERE INDICTED AND BOOKED ON INVOLUNTARY MANSLAUGHTER CHARGES FOR THE 2015 MAULING DEATH OF WERNER VOGT, 85 - "THEY WERE AWARE OF THE AGGRESSIVE DISPOSITION OF THEIR DOGS AND FAILED TO MAINTAIN ADEQUATE CONTROL"
(AP) — A southwest Missouri couple has been arrested after their dogs were linked to the fatal 2015 mauling of an elderly bicyclist, following an investigation during which two of the dogs were given away to unsuspecting owners, according to investigation files. Joseph M. and Lindsay Brink were indicted in October on one count each of second-degree involuntary manslaughter in the death of 85-year-old Werner Vogt. Both suspects were booked into jail on Thursday and released on their own recognizance. Vogt was mauled in November 2015 while riding his bicycle in an upscale subdivision near the couple’s home in rural Rogersville, about 15 miles (24 kilometers) east of Springfield. Vogt, who also lived in the area, died three weeks after he was attacked. Investigators said DNA eventually matched one dog to saliva found on Vogt’s clothing and couldn’t rule out the couple’s three other boxers. The Brinks’ attorney, Dee Wampler, said Thursday that his clients have cooperated with authorities and “deny any guilt or criminal negligence.” It’s unclear why there was a months-long delay between the indictment and the couple being booked. The local prosecutor didn’t return phone messages from The Associated Press on Friday. The Brinks previously settled a wrongful death lawsuit with Vogt’s son for $300,000. The grand jury indictment alleges the Brinks were “aware of the aggressive disposition of the dogs and failed to maintain adequate control of the dogs by allowing them to run at large.” No other details were provided in the document. But files from the Christian County Sheriff’s Office show that an investigator examined the Brinks’ four large boxers shortly after the attack. The investigator found no blood on the animals. In the spring, sheriff’s Sgt. Michael Elliott returned to the Brinks’ home to take DNA samples from their dogs, but Joseph Brink told Elliott he had gotten rid of two of his dogs — Chubbs and Otto — which were among the three dogs running lose at the time of the 2015 attack, according to the Springfield News-Leader newspaper . “It seemed to me that Joseph believed his dogs were likely responsible, and told me he just couldn’t allow himself to keep the dogs, especially since he has a little boy,” Elliott wrote in the report. 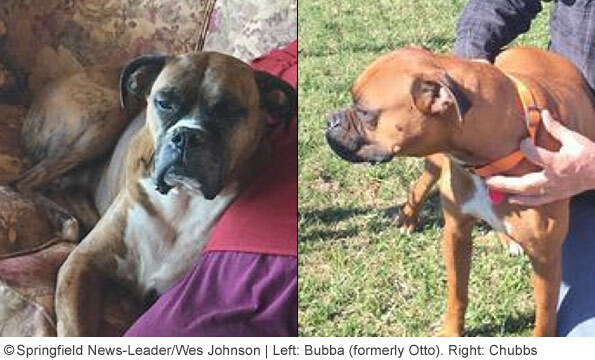 Elliott took DNA swabs from the Brinks’ two remaining boxers, and tracked down Chubs and Otto. One of the dogs had been sent to an animal shelter in Bolivar, where a family adopted it. A Springfield man acquired the other dog through a Craigslist ad. The new owners told the News-Leader they were shocked to learn of the boxers’ possible link to the fatal attack. Jessie Shepardson, director of the Polk County Humane Society, said there were “no red flags” in the initial adoption paperwork for Otto. The intake form indicated the dog hadn’t bitten anyone within the past 10 days but noted the dog “doesn’t do well with little kids.” She said there was no mention of the fatal attack in paperwork filed by the man who brought the dog in. A forensic DNA analyst told the sheriff that DNA tests linked Otto’s saliva to Vogt’s clothing and couldn’t rule out the other dogs.